Planned changes for Archerfield under the 2011-2031 master plan. Proposed expansion of Archerfield Airport looks set to proceed after a government tribunal upheld ministerial approval of the airport’s 2011-2031 master plan. The decision from the Administrative Appeals Tribunal (AAT) concluded a three-year challenge from the Archerfield Airport Chamber of Commerce Inc (AACCI) to overturn ministerial approval of Archerfield Airport’s 2011-2031 master by then Minister for Infrastructure Anthony Albanese in 2012. The master plan for the privately-owned airport, which is located 11km from the Brisbane CBD and mainly used by general aviation, charter and flight training groups, included realigning the grass runways and proposed new facilities for an aviation business park. However, AACCI argued the Minister did not give due regard to community views before approving the master plan and took the matter to the AAT in 2012. In a decision published on July 8, AAT Deputy President Phillip Hack SC said he was “satisfied the process of consultation was both appropriate and meaningful”. “I am then of the view that there is no substance in the Chamber’s criticisms of the draft master plan. The Chamber provides no basis on which the Minister’s decision ought be set aside,” he said in the judgement. 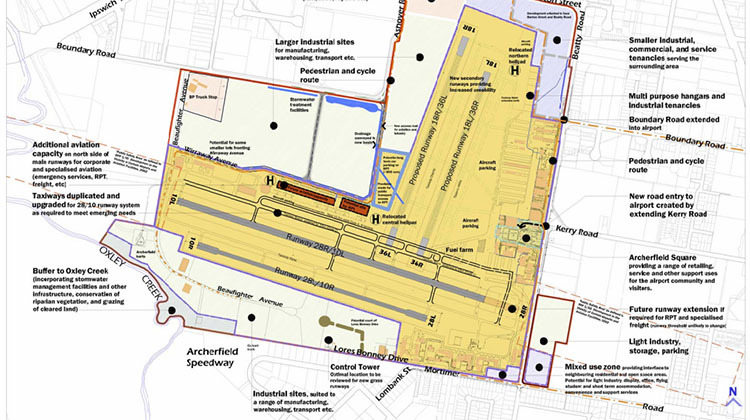 Archerfield Airport Corporation (AAC), the private owners of the airport, said in a statement the 2011-2031 master plan included key initiatives that would “strengthen Archerfield as Brisbane’s metropolitan airport and Queensland’s premier general aviation hub”. “AAC will continue its vision of developing Archerfield into a superior aviation centre and hub in accordance with the approved Master Plan 2011-2031,” AAC said in a statement on Friday. THe AACCI has long taken a different view. “If permitted to stand unchallenged by your Chamber, the Minister’s approval would clear the way for Archerfield Airport Corporation (AAC) to proceed with an irreversible and permanent downgrading of the critical aviation infrastructure that exists at Archerfield Airport. This includes the unacceptable loss of the 04/22 runway complex, the Archerfield control tower, the fuel farms and above all would obliterate many aviation businesses without compensation,” says the AACCI’s website homepage. The full AAT decision can be read here.